Hey folks, here’s a very good deal if you want a combo electronic powder dispenser/scale. The Hornady Lock-N-Load AutoCharge typically retails for around $240 (currently it’s $229.99 at Cabelas and $249.99 at MidwayUSA). Right now, ManVentureOutpost.com has the AutoCharge for just $186.01 (plus shipping). That’s over $50 off typical retail. NOTE: You MUST use Coupon Code SPR2012 during checkout to get that $186.01 price. Act quickly — supplies are limited at that price. 3/5/2012 UPDATE — ManVentureOutpost.com Sold Out of this item, which is now back-ordered. ManVenture is still (apparently) honoring the $186.01 price (with SPR2012 Coupon Code). CLICK HERE to get Hornady Lock-N-Load AutoCharge Dispenser for $186.01. Code SPR2012. That price for the Hornady unit is about $155.00 less than typical pricing for the RCBS Chargemaster (Sinclair sells the Chargemaster for $340.99 plus shipping). For most tasks the Hornady performs quite well. However, RCBS ChargeMaster fans will be quick to note that there has been more accumulated knowledge on tweaking the RCBS machine. But if you want a bargain, consider the “red option” — the Hornady AutoCharge. Share the post "Hornady LnL AutoCharge Powder Dispenser on Sale for $186.01"
Even in today’s digital age, many reloaders prefer the simplicity and reliabilty of a balance scale for weighing powder charges. In this Bulletin, we reported that our own PACT digital scale suffers from fluctuating read-outs. The weight reading drifted up to 0.3 grains in less than an hour. (PACT Story). LTRDavid has come up with a clever upgrade to an O’Haus-type scale that makes the weighing process easier for those of us with old eyeballs. He simply mounts a magnifying glass in front of the balance marker, using two clamps. Pretty ingenious wouldn’t you say? 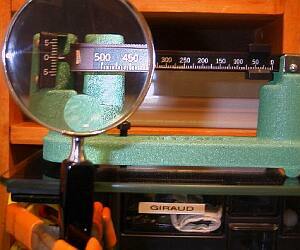 We wonder why the scale-makers didn’t offer a small magnifier as a factory option long ago. For more smart reloading tips, check out David’s website, LTRDavid.net. When working with balance beam scales, be sure you have the device leveled. Even a small amount of tilt will throw off the measurement. We’ve seen folks who keep their scale on a shelf or storage area, and then take it out for use. That’s fine, but remember than your loading bench may not be uniformly level on all sections. Unless you put the scale in exactly the same place on the bench every time (at the same angle), you may have to re-set the level. Likewise, if you take the scale to a range, be sure to re-level it to your new working surface. And remember that is it just as important to level the scale front to back as left to right. Most scales have a leveling adjustment, but that will only level the scale left to right. If your bench has a bad front to back slant, you may have to build a corrective base for your scale. Share the post "Improved View for Balance-Beam Scales"